Select more than one node and then select Edit > Create component or right click in the Graph editor and select Create component in the contextual menu. A dialog opens where you can name the component, assign a color, and add a description. 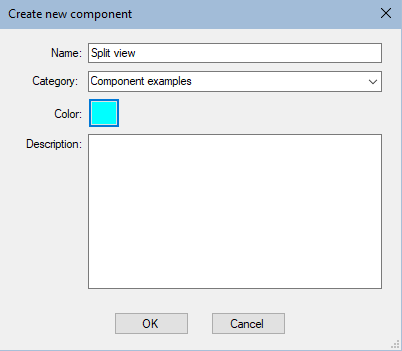 Choose a Category to classify components in the Models window. 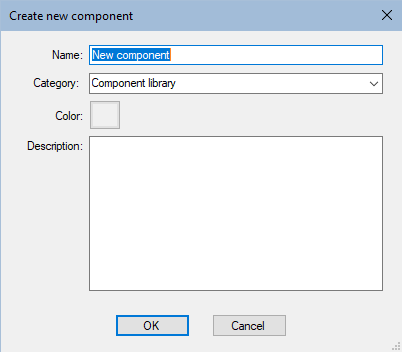 By default, a component is created in the Component library category. 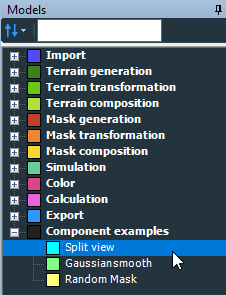 You can also select an existing category, such as Terrain generation, for example. To create a new category, simply type a name in the Category box. The selected nodes are replaced by a single component node. Input and output node connectors are created for each input and output node. See Viewing the component node graph for details. 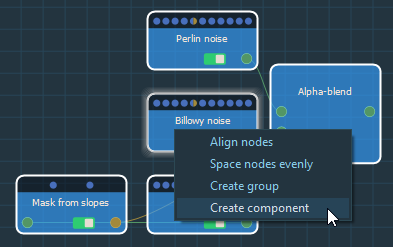 The component appears in the list of nodes in the contextual menu, in the main menu, and in the Models window. Creating components from two disjoint nodes that are linked is prohibited. For example, if you try to create a component with the Perlin noise and Export terrain nodes as shown below, the Apply curve node would be connected to both an input and an output of the component, which is not allowed.